A model rocket or high power rocket consists of a few basic components, and this section covers the basics, it is not meant to cover all areas of the rocket but will be a good starting point to understand how the rocket works and why some times they fail, and when a rocket fails it can be quite spectacular. This is the foremost part of the rocket and it is there primarily to make the rocket streamline and aerodynamic. This is the main structure of the rocket and provides a point to connect all other components, again this is streamline and aerodynamic. This can consist of one part as in most model rockets or multiple sections as in more complex models and HPR rockets. These are here to help provide stability of the rocket, but also produce drag which will lessen the performance of the rocket. So sizing of fins is very important. This provides the propulsion for the rocket and in some cases provides the ejection charge for deploying the recovery system, i.e parachute or streamer. This will consist of a shock cord a cord, webbing or elastic that will join the nose cone and the body to keep then together once the nose cone has been ejected, this will have a parachute or streamer attached which is to slow the descent of the rocket once it has reached apogee (the highest point of its flight). 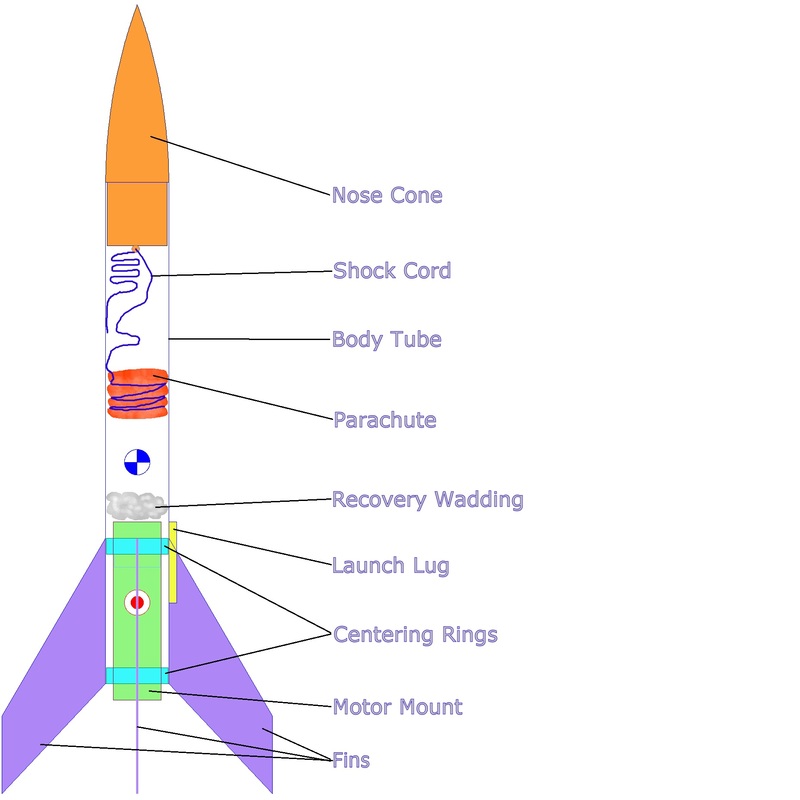 The varying stages of a rocket flight can be split into the following. This is when the motor is first lit, most model motors the ignition is very easy and quick, however some motors may show a slight delay as the motor starts to develop pressure inside to be able to produce enough thrust to lift the rocket. This is the stage of flight where the motor is developing usable thrust that is pushing the rocket. This is part of the flight where the motor is not developing usable thrust and the rocket will be slowing due to drag and gravity. Often during this phase the motor will produce smote to from a trail to aid tracking the rocket. During recovery the rocket may drift with the wind so it important to have a large enough recovery area.